the 2012 United Methodist General Conference in Tampa, Fla.
Conference since 1939. A UMNS photo by Mike DuBose. She loves her United Methodist Church. And her United Methodist Church loves her. 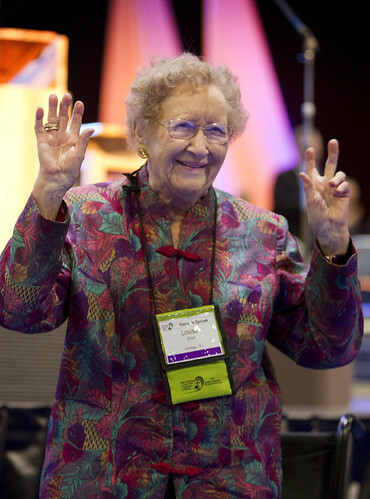 There was no doubt of that when 106-year-old Louise Short was introduced and greeted by a standing ovation at the morning plenary May 1. Some might assume Short, widow of Bishop Roy Short, was applauded because of the number of digits in her age and that certainly may have been part of the reason. However, what really garnered admiration was the announcement that the centenarian has attended every General Conference since 1939. "I just can't understand all the attention given me," Short said. "I don't know what I've ever done to deserve anything. Methodist people are just wonderful people." "I love The United Methodist Church because of their deep interest in people having an abundant life through Christ and because of the peace and comfort they offer others who face hard times." Bombarded with requests for photographs and interviews, Short expressed concern that she would miss the "action" on the plenary floor. "If I don't watch it, I'll just get in there in time for the benediction!" Battling a bad case of shingles that she admitted was sapping her strength, Short said her interest in church business is still strong. She keeps a close watch on United Methodist issues and is aware that change is definitely in the air at General Conference 2012. "As we do our legal work," she said, "we should also remember to help our spiritual life." "My husband was very active and very productive in his ideas in the conduct of The United Methodist Church," she explained. "It overflowed into me. Of course, my main interest is to tell the citizens of the world to follow Jesus Christ." Short, who lives at a retirement home in Hermitage, Tenn., is the oldest of eight brothers and sisters. Five are still living, including a 100-year-old brother. Both her parents lived beyond their 100th birthdays. "In our family, we don't believe in dying," she laughed. "It's been marvelous for me to live this long." Nevertheless, as she continues to lose generations of friends and loved ones, she said it gets harder to say goodbye. Her recent turn of health has left her weakened, and she isn't the spry young thing she was at her 105th birthday party. "But I'm not afraid of dying," Short said. "He, who has kept me all this time will keep me the rest of the time. I'm blessed." *Passi-Klaus is a public relations specialist for United Methodist Communications.